Far Northern Maine’s foliage season runs roughly from mid-September to mid-October, but this varies widely depending on weather, topography and geography. During this time, the deciduous trees of Maine begin their colorful transformation.Columbus Day Weekend is often the focal point of fall foliage excursions although “peak colors” usually arrive well before the end of October in most of northern and central Maine. 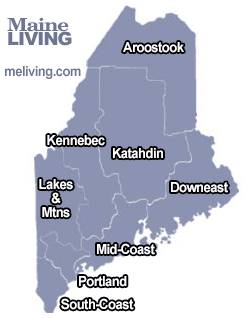 Ask us about Maine Foliage or share your Maine Fall Foliage tour comments. To feature your business, contact us. Before starting your North Country tour in Houlton, railroad and history buffs may want to stop off in Oakfield (exit 60 off Interstate 95) to check out the beautifully restored Victorian Train Station and Oakfield Railroad Museum (museum open Memorial Day weekend through Labor Day). Dating back to 1910, the station offers visitors an intriguing look into Maine’s railroading past. From Houlton, take Route 1 through the traditional farming communities of Littleton and Monticello. When you arrive in Mars Hill, take Route 1A to Fort Fairfield, where the Aroostook Valley Country Club‘s course is split between Maine and Canada! From there, take 161 to Caribou, gateway to the 80-mile Fish River chain of rivers and lakes, which is nationally recognized for its amazing salmon and trout fishing. Continue north taking Route 89 through Limestone, then up 1A to Van Buren. In Van Buren, part of the distinctly French-influenced St. John Valley, visitors are just as likely to hear French spoken as English. This is due to the area’s Acadian heritage, which dates back to the 1700s. Don’t miss the Acadian Village (Village Acadien), an historic site comprised of over 12 buildings that recreate a traditional French Acadian settlement, complete with artifacts and cultural events. Continue from Van Buren down Route 1 and over to New Sweden, where you can enjoy panoramic views of Canada from the town’s park benches. Lille, where the Mount Carmel Museum and Cultural Center (converted from a twin-spired wooden church) offers wonderful musical performances. Pick up Route 161 north to Madawaska. Visit the historic site along the breathtaking St. John River, where our ancestors first stepped foot in northern Maine. The spot is marked with a huge cross, erected at the location where Acadians landed after fleeing from their Nova Scotia homeland to avoid being deported by the British. Once you’ve taken in the very northern-most point on this tour, hop on Route 1 west to Fort Kent, where an 1839 blockhouse built to protect local timber interests during border disputes with Canada still stands. While you’re here, rub elbows with the locals at the Annual Scarecrow Festival. This off-beat event features a scarecrow-building contest, costumes and rollerblade bingo. From Fort Kent, head south on Route 11 to Eagle Lake, stopping to enjoy the local wildlife area. Continue south on 11 to Ashland, site of the Ashland Logging Museum. This area also offers several traditional-style fishing and sporting camps providing charming, rustic accommodations, hearty meals and access to boats, guides and gear. Pick up Route 163 over to Presque Isle where you can stay at one of the numerous local hotels and take in the Presque Isle Air Museum, featuring the unique, the rare and the historic, pertaining to the early days of air conflict and Maine aviation. Enjoy a day or two in 600-acre Aroostook State Park, which offers swimming at Echo Lake and hiking on Quaggy Joe Mountain (which offers magnificent foliage views of Mt. Katahdin from its peak). Finish this loop by taking Route 1 south, back down to Houlton.